Helpful links and frequently asked questions for current Rollins chemistry students. 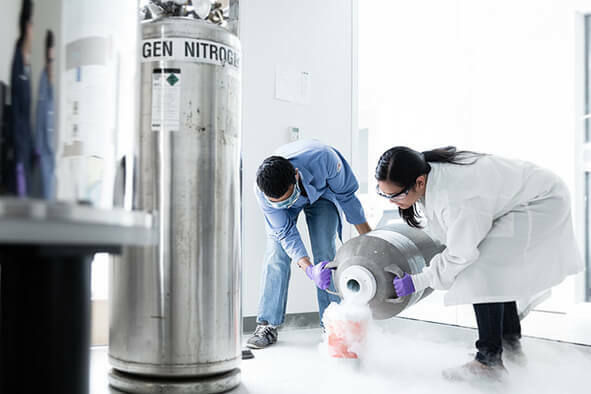 Rollins students Ibrahim Musri and Mutya Cruz work to maintain liquid nitrogen for our NMR. All organic chemistry students use the NMR to obtain data on molecular structure. 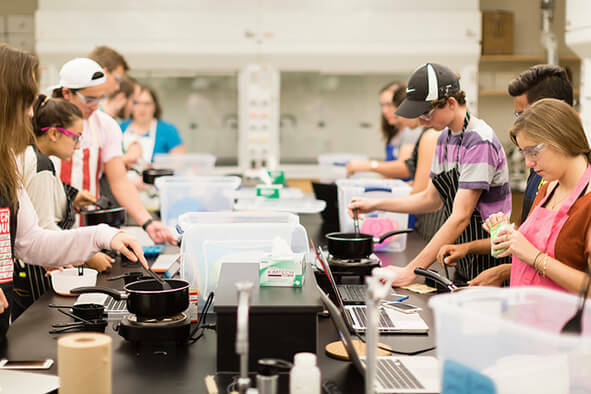 The Rollins chemistry faculty offers a wide range of courses from cooking chemistry to forensics in our Honors or rFLA general education curriculum. 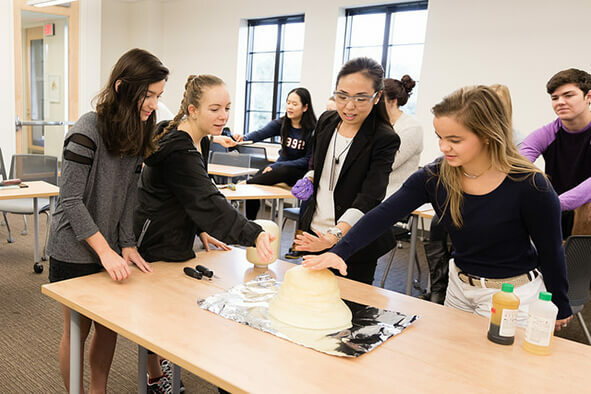 Our small classes allow for fun demonstrations and plenty of time for problem solving! Can a chemistry professor be my academic advisor? If you are majoring in chemistry or biochemistry/molecular biology, it is highly recommended that you are advised by one of the chemistry faculty by the beginning of your second year at Rollins. Majors who are also on a pre-health track should email Dr. Habgood. Direct other inquiries to Dr. Bernal, Dr. Riley, Dr. Park, or Dr. Patrone for additional information. Can I study abroad if I am a chemistry or biochemistry/molecular biology major? Absolutely! Our students study abroad in countries like Italy, Australia, and Germany. Begin by talking to someone in the Office of International Programs to learn more about your options, then contact your chemistry advisor to work out an individualized plan within the major. Where can I learn more about careers in chemistry? The American Chemical Society has an excellent portal for undergraduate chemistry students to learn more about the transition from college into a career and how to find your dream job. Learn more. Want to read more? There are excellent books relevant to chemistry for biochemistry majors, including The Next Gen Ph.D., Networking for Nerds, and Career Opportunities in Biotechnology and Drug Development. I may be interested in research, but how can I learn more about what it is and if it's for me? How do I apply to the Rollins summer research program? Rollins is fortunate to have a competitive Student-Faculty Collaborative Scholarship Program (SFCSP) that runs each summer. Applications to the SFCSP are made through an individual research proposal that each student and her/his faculty mentor develop as an independent study project in the spring semester. Check out the faculty page for information on each professor's area of expertise and contact a person with whom you may want to work. How can I find off-campus summer research opportunities? Unique opportunities abound for students interested in preparing for graduate school with off-campus research. Paid and unpaid fellowships and internships are available in the U.S. and around the world. There is a complete list of biomedical research internships compiled here. How can I learn about research active faculty in graduate programs? With the DGRweb you can search for faculty, institutions, and research experiences for undergraduate. Click here to find more information. Where can I learn more about how to prepare myself to apply to graduate school in chemistry? First, explore the ACS's Planning for Graduate Education in Chemistry portal page. Next, meet with your advisor as soon as you know this is the path for you.